Welcome to 2015! Firstly apologies are in order for not posting for ages, although it’s not a great excuse the first year of my PhD has been very busy (in a good way) and my research is finally taking shape (more on that to come). Nevertheless, one of my new year’s resolutions was to post here more often so I’ll be endeavouring to pull my various fingers out and get writing. To jump right in, we’ll begin this year with a piece about seeing the light, or rather seeing a part of it. 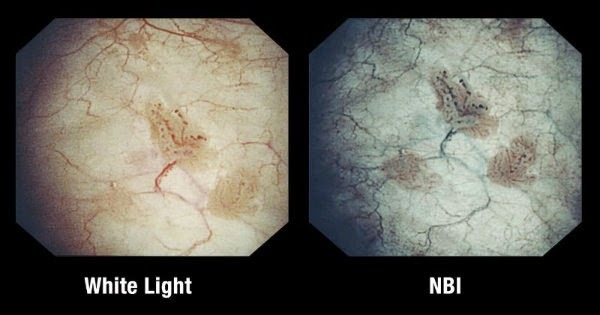 Narrow band imaging (NBI) is a technique that can be used with video laparoscopy (or other endoscopy technique) whereby certain colours of light are shined onto an area of interest to enhance the image. In this case red light is filtered out to make the image appear in shades of green and blue. This is useful because the main component of blood absorbs blue and green light, making blood vessels or blood containing lesions, appear darker and therefore, easier to see. Here is an example of the technique used to enhance an image of bladder cancer. On the left is an unaltered image of bladder cancer as the surgeon would normally see through the endoscope. On the right is the same image but with the red light filtered out using the narrow band imaging. The difference is quite striking; the blood vessels and even the diseased areas become much more clearly discernible. Whilst this approach has been predominantly used for the identification of potentially cancerous tissue, it has led some to investigate whether narrow band imaging could be useful in enhancing subtle areas of endometriosis that could otherwise be easily missed. 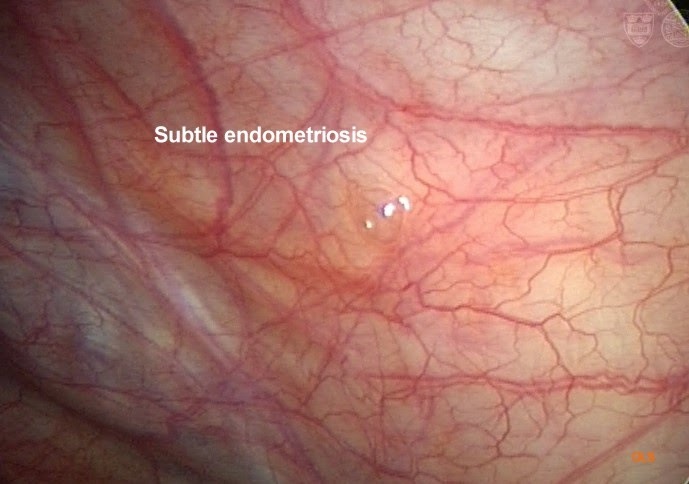 A study published this month has shown that narrow band imaging can indeed be useful for enhancing the appearance of endometriosis. In particular it was found that this method made clear vesicular lesions of endo easier to identify. Under normal circumstances clear vesicular lesions look like tiny see-through bubbles, making them particularly difficult to spot. Below is an example of a vesicular lesion, it’s made slightly easier to see in this image by the light reflecting off its surface. Complete removal of all endometriosis is the best chance anyone stands at gaining relief from the associated symptoms. Therefore utilising new technologies such as this to improve the visualisation of the disease can only mean more thorough excisions and better outcomes for the patient.